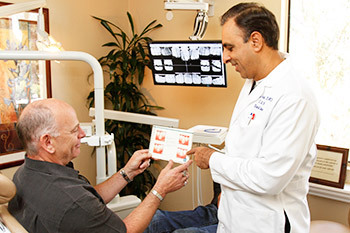 Periodontal Bone Regeneration in Mission Viejo | Orange County Periodontists | Ajay B. Setya, DDS, MSD Robert C. Hirst, DDS, MS Christen S. Bergman, DDS., MS. Your teeth are anchored in sockets along a platform of supporting bone on your upper and lower jaw. That platform is known as the alveolar ridge. Strong ligaments and bone firmly support the teeth in their position on the ridge and keep the teeth stable. The bone supporting your teeth can be lost for a variety of reasons and the teeth can be weakened or even lost. But new bone can be regenerated where it has been lost and your teeth and jaw can be preserved using bone grafting techniques. As periodontists, Dr. Setya, Dr. Hirst, and Dr. Bergman are highly trained and accomplished in advanced bone grafting procedures to regenerate lost bone. They keep current with continuing advancements in bone grafting procedure and use advanced technology to ensure the procedures are efficient, accurate and minimally invasive. Gum disease – the bone is eaten away by bacterial plaque and calculus that cause bone loss, and worsens as the disease progresses in severity until the bone can no longer support the affected teeth. This causes the teeth to be eventually lost. A missing tooth – the bone supporting your teeth needs to be stimulated by biting and chewing pressure to maintain it’s volume and density. When that pressure is absent, the bone gradually dissolves away. A tooth out of alignment – a tooth out of its proper position can fail to make adequate contact with the tooth on the opposing arch. This can reduce the biting and chewing pressure under the misaligned tooth and thus lead to bone loss. Tooth injury – Trauma or injury to the tooth can throw it out of its proper position or cause the tooth to become infected. The misalignment or infection can both cause bone to be lost around the tooth. Infection in the jaw – Tumors, viral infections or bacterial infections not caused by gum disease can enter the bone tissue surrounding your teeth and cause bone loss. Dentures do not provide the stimulation needed to maintain the bone density and volume of your jaw. In fact, the pressure exerted by dentures actually accelerates the bone loss and wears away the ridges of jawbone that used to support your teeth. As the jaw bone ridge wears away, your jawbone size and height progressively shrinks and the lower third of your face progressively collapses. The shrinking of your jaw bone also requires that the denture be continually refit. The recurring lack of fit causes sore spots on your gums and can make chewing painful. Bone loss caused by wearing dentures causes the lower third of your face to eventually collapse. The doctor will explain how bone grafting works before treatment begins. Bone grafting is frequently done as a part of periodontal surgical procedures. To perform a bone graft, the doctor places biocompatible material into the space where the bone is missing. The bone graft material itself does not actually become the new bone tissue. It stimulates the regeneration of new bone tissue by the body. The new bone tissue will fill up the space where the bone graft material is placed and the bone graft material will harmlessly dissolve into the bloodstream. Dr. Setya, Dr. Hirst, and Dr. Bergman use advanced technology to make bone grafting minimally invasive, efficient and fast-healing. The doctor will use our cone beam 3D CT scanner to get a comprehensive view of the bone around your teeth and determine where bone grafting is needed. The scanner creates 360° 3D images of your entire jawbone and shows the exact amount of bone surrounding your teeth as well as the bone density. The images can be viewed from any angle and magnified to show small areas. From this close inspection Dr. Setya, Dr. Hirst, or Dr. Bergman can plan the bone grafting procedures ahead of time and perform the grafts efficiently. The doctor uses processed collagen membranes to hold the bone graft material in place and secures the membrane and the gum tissue covering it with dissolvable suture. This removes the necessity of a second procedure to remove them, and makes the graft procedure far less invasive and speeds healing time. Dr. Setya, Dr. Hirst, or Dr. Bergman will add growth proteins to the graft site to enhance healing. These growth proteins prevent swelling, prevent infection and accelerate bone regeneration. Dr. Setya, Dr. Hirst, or Dr. Bergman will place bone grafts and regenerate lost bone to support teeth, to build back the size and shape of the ridge supporting the teeth and to provide adequate bone support for a dental implant. A tooth that has bone loss around it leaves the tooth unstable and can lead to tooth loss if the bone loss worsens or the bone volume is severely deficient. The doctor places a graft into the area of missing bone and rebuilds the necessary bone support for the tooth. Bone grafting can even be done to replace a diseased root in a molar and provide the necessary support for the tooth. This saves the tooth and averts the need to extract and replace it. After a tooth is lost or extracted, bone loss occurs where the tooth used to be. The bone loss in the area of a missing tooth can also cause bone loss around adjacent teeth and cause those teeth to lose support and shift position. Dr. Setya, Dr. Hirst, or Dr. Bergman place a bone graft into the site of the lost tooth and regenerate the bone needed to build back the ridge to its proper height, width and stability. The regenerated bone will support the adjacent teeth and keep them stable, and will provide the foundation for a future dental implant at the same time. A dental implant needs adequate bone structure to be placed securely. The doctor will place a bone graft at the implant site when needed so there is adequate bone for an implant to be stably anchored. You have sinus cavities on each side of your face above your upper molars. When you lose teeth in the back section of your upper arch, bone loss occurs in both the alveolar ridge and in the floor of the sinus cavity. Over time, the bone loss occurring from both ends can make the bone too shallow to support a dental implant. To rebuild bone depth, Dr. Setya will add bone graft material at the bottom of the sinus cavity under the sinus wall membrane. The procedure is known as a sinus lift. After a tooth is lost in the upper arch, the bone under the sinus floor diminishes. A bone graft is placed under the sinus floor membrane to regenerate the needed bone support for an implant.